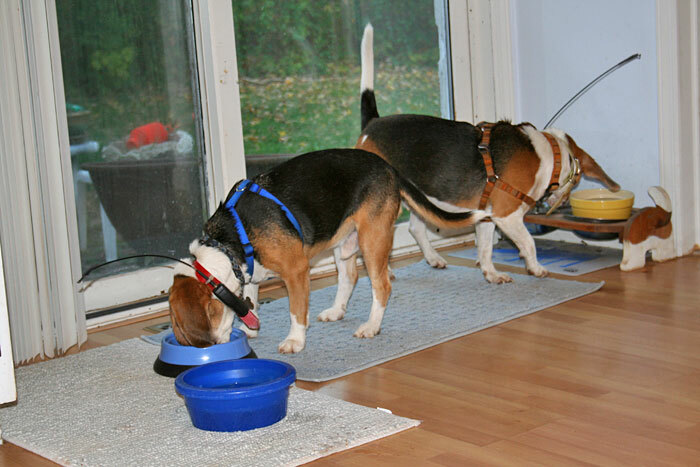 When the evening walk occurs before dinner, there is simply NO time to get undressed before eating. Sherman is still looking a bit thin, so he’s getting a little extra for every meal. The other three of us are quite jealous. Happy Halloween everyone. 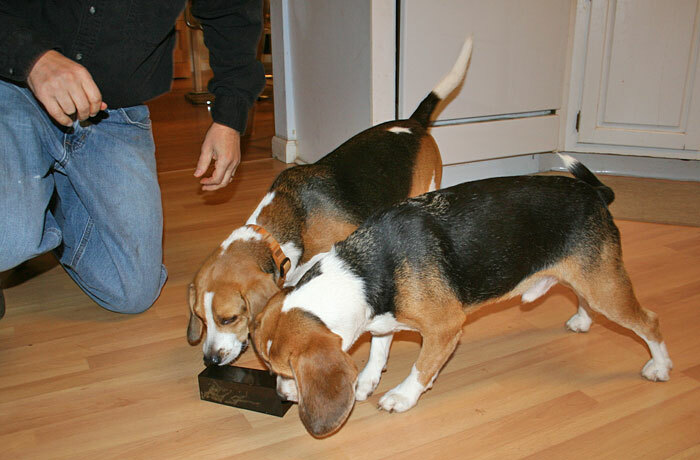 Keep the chocolate away from the dogs! Just a few answers to some questions about the calendar. 1. The calendar will cost $15 if you pay by check and a little more if you use PayPal (so I can offset their fee). Ron A. is VERY generously donating the printing and I’ll cover shipping to the US but will ask for a little extra to ship out of the country. 2. All proceeds will go to beagle rescue, and I’ll let you know later on which rescues when I get an idea of how much money we can raise. 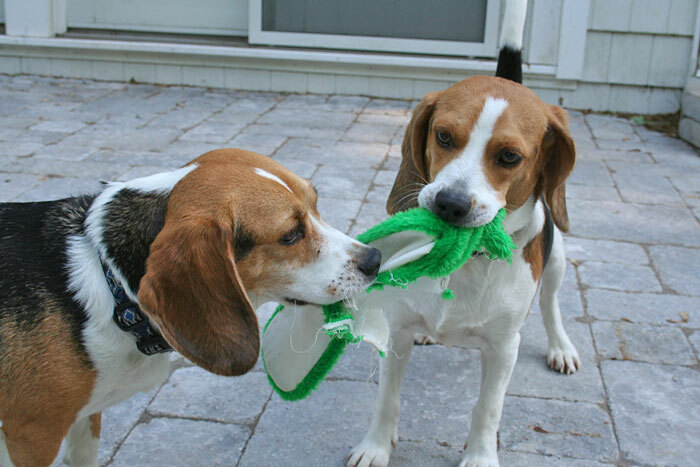 One rescue is definitely SOS Beagle Rescue, having blessed us with Clayton, Stanley and Sherman. 3. 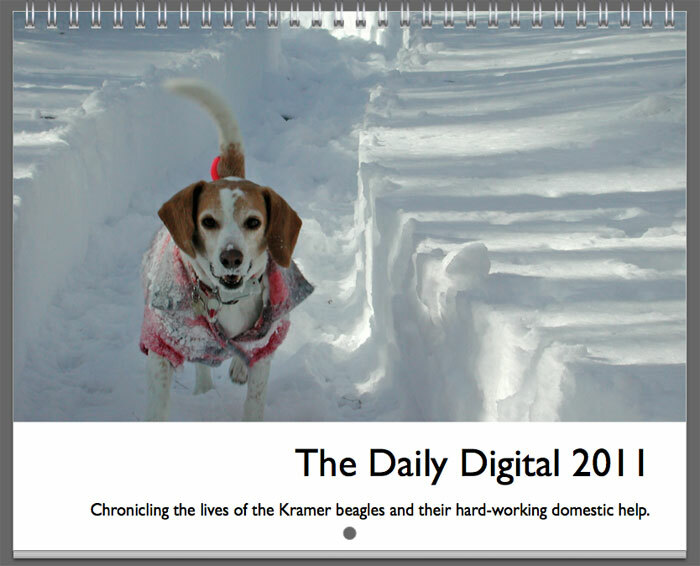 This weekend I will put together a mock-up of the calendar, order information, and an online sign-up sheet for your beagles’ birthdays. 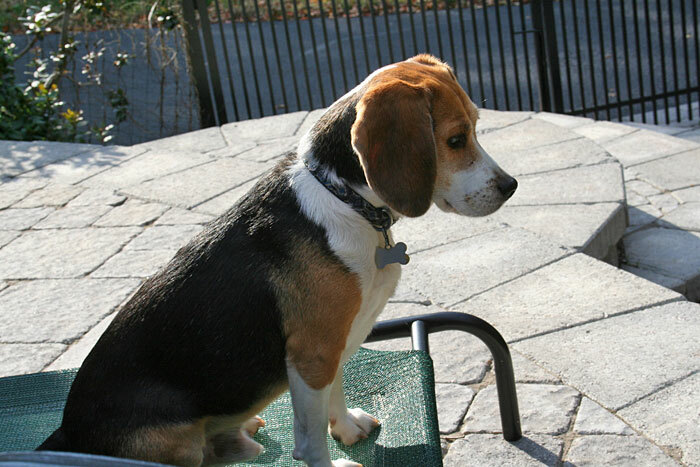 I’m having trouble organizing the data from your comments and emails, so I’ll ask everyone to re-enter their beagles’ dates on the upcoming sign-up sheet and you’ll have at least a week to do so. 4. I hope to ship the calendars by late November, and will keep you posted about that. 1. The cover photo of Scooter was Phillip’s idea. I lost track of the count of his good ideas many, many years ago. 2. How’s this for a coincidence: Ron A. works in the same town as Phillip! 3. Connie asked about site visits to the DD. It ranges from 600-900 on weekdays, about a third of that on the weekends. Lot of quiet people out there! Hope you’ll buy a calendar! Tuie the sheltie passed away on Tuesday, in her mom Sara’s arms. (Sara is Phillip’s sister.) She was 16. Since February, Sara had unselfishly devoted herself to extending Tu’s life and enhancing her quality of life. She gave her IVs and tube feedings, and it bought Tuie many more months of prancing and barking. Tu taught me what herding dogs are all about. When she’d stay with us she’d guard the door and if you went anywhere near it she would bark and do a little whirling dervish dance. You weren’t going to leave HER flock, oh no. 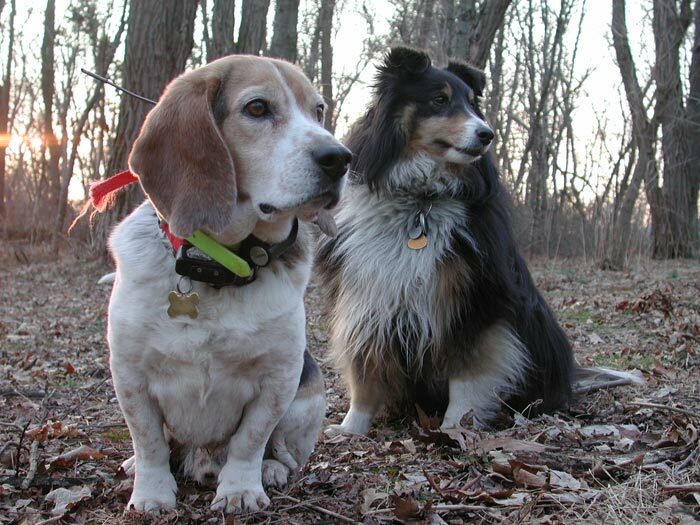 She was a sweet and funny dog and everyone will miss her. I’m sure she’s met up with the boys by now. Don’t compliment me on the classy layout, fonts, etc. It’s all iPhoto. If you have a Mac, you can make something this nice as well. I’ll try to get the whole calendar up this week, but Monday is probably more like it. By the way, one more BIG Aroooo! goes out to Deanna, who came up with the calendar idea on August 5th! The saga of the driveway continues. It took until today (a whole week) for UPS to come out and inspect the damage. Now it’s been turned over to their insurance company. I have a feeling the footprints will be there for awhile. I laugh every time I see them. What could he have been thinking? First off, many thanks for all your kind words in response to Friday’s “Blogger’s Block.” I love my audience, you’re all great! Second, a big thanks to Joe O’D who recommended TD Bank for our coin-counting needs. I went on Saturday with four large bags of coins. There was no fee to use their counting machine, and when one of the tellers saw how many coins I had, he came over and expedited it. I took home $208.91! But be warned, the bank is going to start charging 6% if you’re not a customer. Third, I’ve selected the photos for the calendar! I’ll show them to you soon. Phillip had a great idea and that is to put your beagles’ names (including last if you’d like) and ages on the days of their birthdays (or adoption days, or any other day you might prefer.) You can post this in the comments or email me at dd @ lauriekramer.com. Finally, Stanley’s new hobby is to bring Phillip’s socks downstairs. 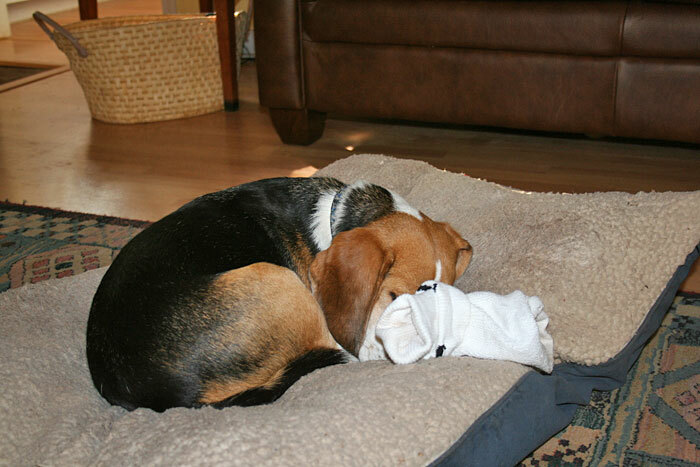 Since dogs don’t think to move stuff that’s in their way (imagine how enriched their lives could be if they did) Sherman fell asleep with his daddy’s sock on his nose. Phillip was about five miles on his way to work yesterday when he realized he’d forgotten to take the mice. Yes, you read that correctly. Our first night of mouse roundup yielded TWO MICE in ONE trap! I had put his keys in the mouse transportation box, and left a friendly reminder (“MOUSE!”) on a sticky note, but somehow he left the house without them. Animal lover that he is, he turned around and went home for them, so they wouldn’t have to spend the day in their little condo. We were out of peanut butter so I baited the trap with some shredded cheese and made a little welcome mat with a dab of blackberry jam on the door. No mice today!! Box. Big box. Cute little beagle in the big box! The UPS man delivered the box yesterday. That would be the same day we had our driveway resurfaced. Perhaps this was a good opportunity for the UPS man to deliver the box to our neighbor instead? No! 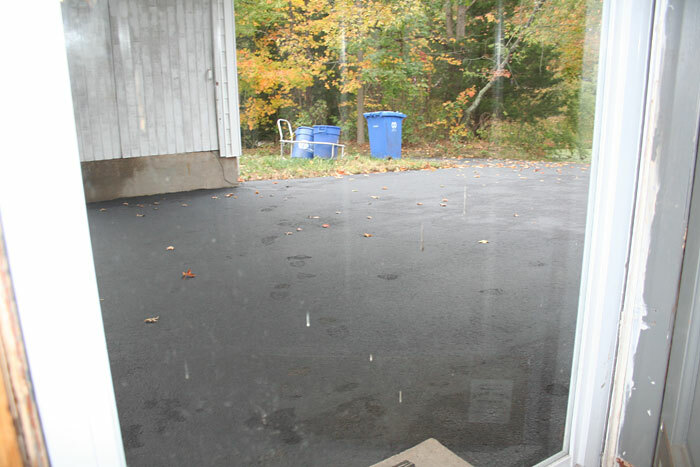 Because apparently UPS men can float just above the driveway and not leave any footprints on sticky tar.